The Craze Presented by Syncrude is back!!! Once again, MacDonald Island Park is opening its doors for all to enjoy a family-friendly New Year's Eve Party! Featuring live entertainment from Team T&J and Magician David Thiel on the MIX 103.7 & 100.5 CRUZ FM Main Stage. Other entertainment highlights include meet and greets with Paw Patrol’s Skye and Chase and Dorothy and Wags from the Wiggles presented by Kidomo Inc. 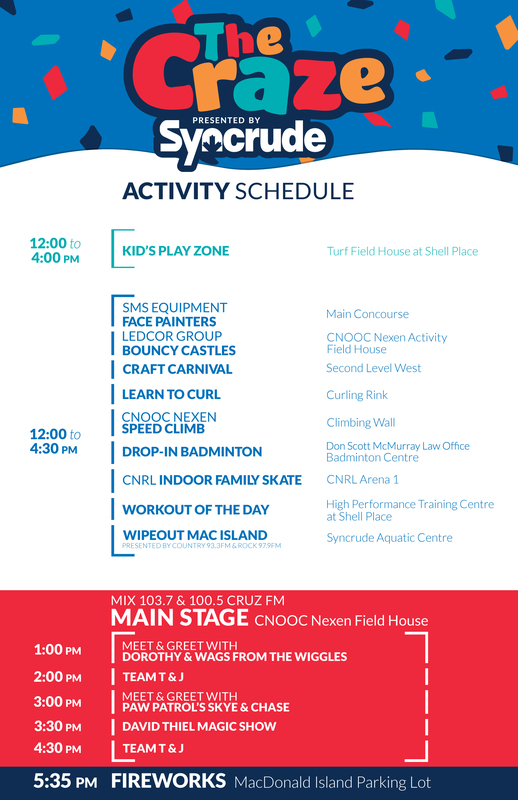 The Craze Presented by Syncrude features free activities for all ages, including live entertainment on the Main Stage from 12:00PM - 5:00PM and will be followed by Fireworks at 5:35PM.